Some people spell it "lens" and some spell it "lense". I'm going to use "lens". If you haven't already read my two previous articles on this topic, Fire From Ice #1 & Fire From Ice #2, have a look for some background. How to Predictably Make a Good Lens "in the field"
Eureka - it was always staring me in the Face! 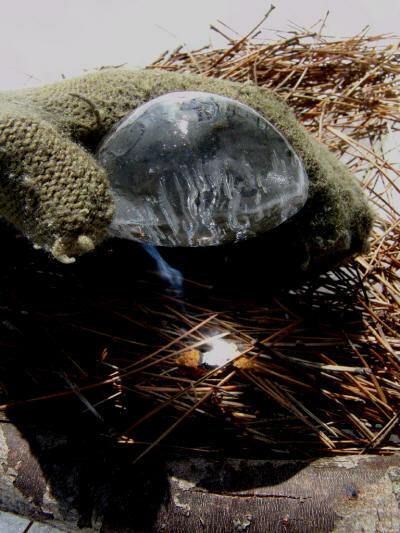 Obtaining clear ice is almost as much of a challenge as making an ice lens! It is interesting that ice "wants" to be clear. When water molecules freeze, they like to form a regular crystal lattice. Any air or impurities that aren't the same "shape" as the water molecules are rejected. As ice forms, it will try very hard to be pure and clear. At some point, when the concentration of "other stuff" is high enough, the ice "just can't take it anymore" and has no choice but to allow impurities to get included. Have a look at an ice-cube in your refrigerator. You will probably notice that the outside of the cube is clear, and towards the centre it starts to get cloudy. What happened is that the ice formed from the "outside in." The outer part of the cube formed first. As the ice grew, it pushed the impurities to the center - where they finally froze. 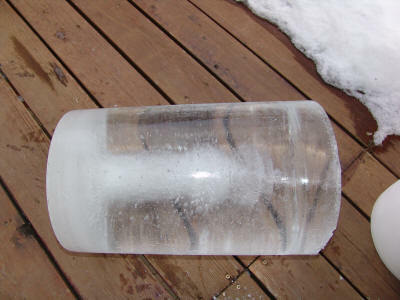 Here is a photo of the ice that I got from pouring water into a large bucket and letting it freeze. As with an ice cube, you can see that the impurities got pushed to the center. 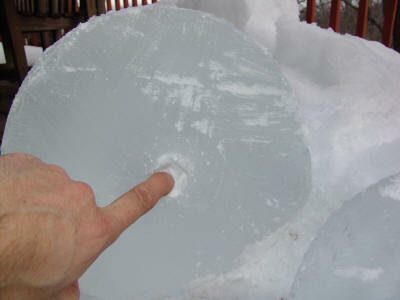 After sawing off the top portion of the ice, there was a hole about an inch in diameter in the centre. This is where the dissolved air had been pushed. 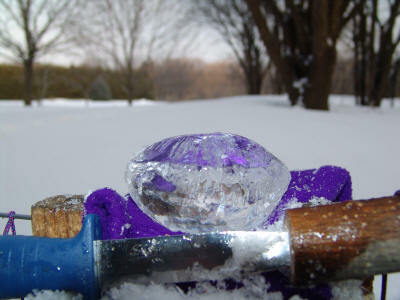 After a bit of sawing, I had a "slab" of clear ice. Try gradient cooling. If ice forms "from one side" only, then it will push the air to the "open" side. Cool slowly. If the water is cooled too quickly, the ice doesn't have enough of a chance to push the impurities ahead of the freezing interface. Try to remove the air/impurities either mechanically, or by dilution. Apparently some ice makers use a cooled tray that has water slowly flowing over it. This embodies the above three principles. The cold comes from one direction only - so air/impurities are pushed upward. The flowing water constantly carries away the impurities. If the ice forms slowly enough, no air is captured. Think about why icicles are often clear - an exercise left to the reader. There are lots of good references that explain optics and lenses in great detail, so I won't try to to explain it poorly! It would however be useful to touch upon a few things that are important for fire making. If we stick two plano-convex lens together, we end up with a double-convex lens. This would be the structure of a typical magnifying glass. Index of Refraction: The index of refraction is a number that corresponds to the amount of bending that light will experience when traveling from one medium to another. The larger the differences in the refractive index, the more bending we get. For us, the more the light bends, the closer the focal point and the higher the magnification. Unfortunately, water and/or ice aren't the best materials for lenses. If we compare the indices of refraction, we see that Ice has the smallest number. Therefore, if we were to build two lenses identical in size and shape, one made from glass and one made from water, the lens made of glass would have higher magnification and would do a better job at starting a fire. 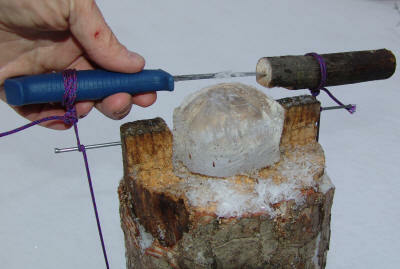 To make an ice lens with the same magnification necessitates that we increase the curvature. The conclusion - everything points to our ice lens needing to have as much curvature as we can give it in order to be effective. A "flat" lens - even if it is big, has very little chance of success. When I tried to make lenses by hand, even though I thought that I knew what a good spherical lens looked like - I was usually wrong. Since the lens we are trying to make has a spherical shape, if we go back to math class, we can define a sphere as a surface that is defined by a constant radius. So, let's go build something that does this in the bush! First I made a draw-knife from a sheath knife and a piece of branch. Next, I shaped the end of a log to leave two "ears." I added a nail to each ear. With some string, I had a setup as in the photo. Image pulling the knife to the front of the picture. It will follow a radius defined by the length of the sting. The nails define an axis for our "virtual" sphere. After each stroke of the knife, the ice "blank" is rotated a few degrees and shaved again. This process is continued until one has a lens. 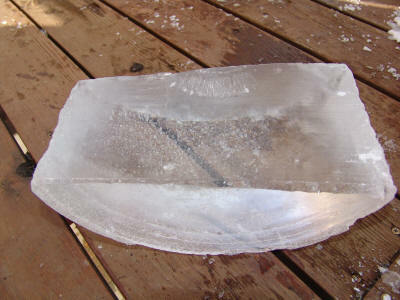 It is important to note that to take off more ice, one needs to raise the ice. Do not shorten the string. If the string is shortened, then we have defined a new curvature. Instead, place something under the ice. This photo shows the lens with one side done, and the other side partially done. In this case, I used a glove to shim up the lens. One could also use snow etc. It is not necessary to have the same curvature on both sides of the lens. With a bit of bare hand polishing, I had my lens. This photo shows the lens lighting a piece of tinder fungus. It took only a second or two for the tinder to light. Note how aggressive a curvature was used on one side of the lens. Note also the fracturing that you can see in the ice. On a warm day, the ice deteriorates rather quickly.